The Saga of the Saiga: creepy, but dwindling. If animals were made of Lego-like pieces that you could wedge together, the Saiga is something an unscrupulous child would put together. Let’s see here: I’ll take the nose of an anteater, the legs of a paraplegic baby deer and let me mount these two carrots as a headpiece. Great, now let me run it over with my train set. 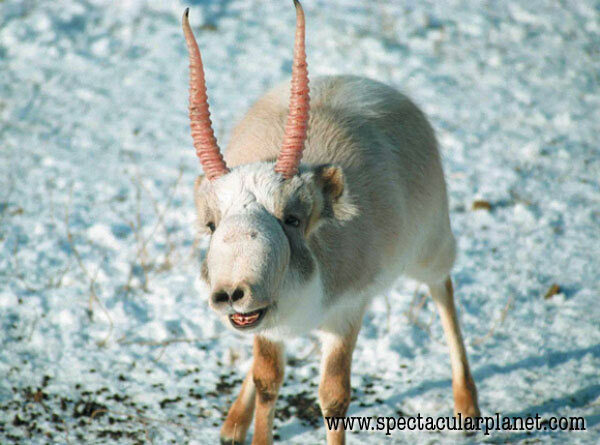 Sadly, this ungulate is critically endangered, all because some ancient culture’s mixed drink recipe included Saiga horns as an ingredient. As a result, these proudly-creepy creatures are running around the steppes of Mongolia with GPS units attached, hoping to attract mates while looking like cyborg-sheep-anteater-goat-vegetables. We wish them the best of luck in their reproductive endeavors.